I’ve scoured the web for tons of the coolest ideas for How to throw an Emoji Party that kids will love. An array of expressive faces to punctuate sentences adds a little extra personality to the texts that fly among tweens. And what better way to feed their love of these itty-bitty digital faces than by hosting a birthday bash where kids can really get in touch with their emoji-onal side? 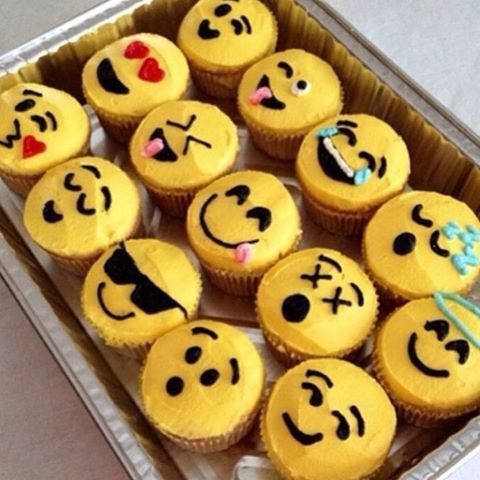 Emoji cake ideas and dessert inspiration for an Emoji Party. From birthday and graduation parties to school events, an emoji party theme is fun for all! 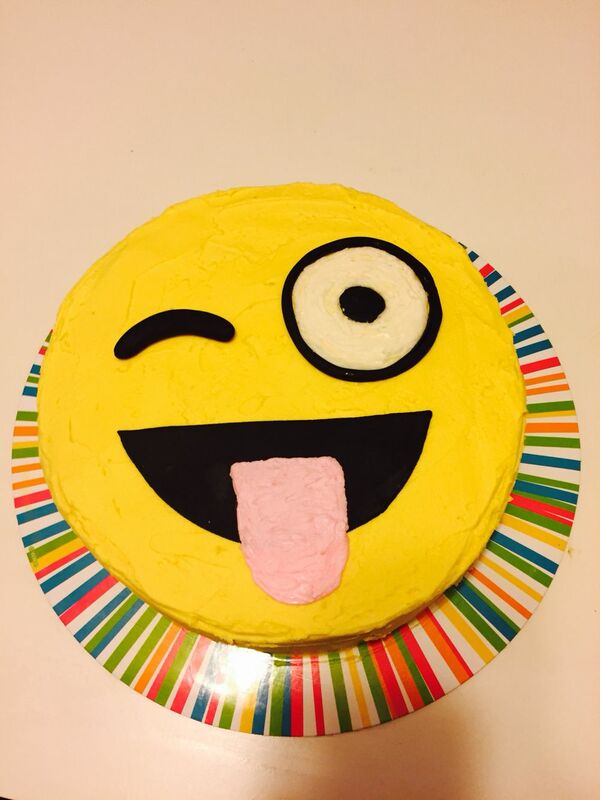 Emoji birthday cake for Madison’s 10th birthday! How to throw Emoji Party for that special person in your life. Here are tons of the coolest ideas for how to throw an emoji party that kids will love. Let’s face it: emoji make texting a whole lot cheerier. An array of expressive faces to punctuate sentences adds a little extra personality to the texts that fly among tweens. And what better way to feed their love of these itty-bitty digital faces than by hosting a birthday bash where kids can really get in touch with their emoji-onal side? Decorate by sticking emoji decals on your walls, and create a giant emoji for Pin The Face On The Emoji. Face it these Emoji Bounce Ball are sure to put a smile on your face. These make for the perfect gift for your party bags. The Emoji Bounce Balls come in a pack of 6. Yellow Star Hanging Decorations provide rich and elegant accents for classy event themes. From versatile fabrics to beautiful yellow Party Supplies these provide a foundation for your decorating needs. Party Supplies create a festive feeling that guests will love. Use yellow Hanging Decorations and Party Decorations to create a special feeling at your party. Our Yellow Star Hanging Decorations feature 3 yellow swirls which feature a star cut-out at the bottom. These Yellow Star Hanging Decorations come in a pack of 3. Add layers of colour to your party with our Yellow Puff Ball Decoration. The pack includes one puff ball which measures 16 inches in diameter. 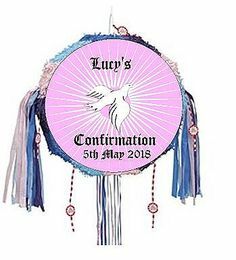 The Paper Pom Poms feature a puff ball design which needs to be fluffed up and is perfect for hanging from ceilings or doorways to instantly bring fun to your party. 1 Yellow Puff Ball Decoration. Every venue needs brightening up for a party and here at Partyworld.ie we have everything you need to transform your party venue. Choose from 100's of Party Decorations and Paper Lanterns for walls, ceilings and tables. Enhance your party theme with stunning scene setters, Paper Flowers and Party Streamers. Be a fan of colourful Party Supplies. Our Yellow Paper Fan features a beautiful fold out circular fan made of delicate tissue paper. A cardboard tab at the top and included string allow you to easily hang these Paper Fans from walls, windows and doorways. The Yellow Paper Fan is 16 inches in diameter when fully opened. Every venue needs brightening up for a party and here at Partyworld.ie we have everyting you need to transform your party venue. Choose from 100's of Birthday Party Supplies and Party accessories for walls, ceilings and tables. Enhance your party theme with stunning Scene Setters and Paper Lanterns. Turn your party from blah to wow with Birthday Supplies from Partyworld.ie. From Birthday parties to big events we have got you covered. Decorations and Partyware set the pace for any kind of party. A birthday is a very special occasion and is best when celebrated with family and friends. Using some imagination and creativity you are sure to create a strikingly stunning look for any room. After all it is a very special day that come's just once a year. Here at Partyworld.ie we have extended our Party Supplies Online to help suit every needs. From Disposable Plates to Paper Plates, from Paper Cups to Plastic Plates we have it all. 18 Pack Of Yellow Cutlery. The Soild Colour Partyware is an exciting decorating option for any party, birthday or baby shower. Here at partyworld we carry a huge selection of Solid Colour tableware and partyware in all different colours of the rainbow. Let your imagination reign supreme and come up with some crazy colour combos. Solid Colours serve to accentuate your party theme and are easy on your pocket as well. With solid colours you can never go wrong. Quantity Per Pack: - 1 Sunflower Yellow Plastic Tablecover. Size: - 54" x 108" Sunflower Yellow Plastic Tablecover. Please Note: Solid Colour Shades May Vary. Yellow Plastic Cups The Soild Colour Partyware is an exciting decorating option for any party, birthday or baby shower. Here at Mypartyworld we carry a huge selection of Solid Colour tableware and partyware in all different colours of the rainbow. Let your imagination reign supreme and come up with some crazy colour combos. Solid Colours serve to accentuate your party theme and are easy on your pocket as well. With solid colours you can never go wrong. Quantity Per Pack: - 12 Yellow Plastic Cups. Size: - 270ml Yellow Plastic Cups. Please Note: Solid Colour Shades May Vary. The Soild Colour Partyware is an exciting decorating option for any party, birthday or baby shower. Here at partyworld we carry a huge selection of Solid Colour tableware and partyware in all different colours of the rainbow. Let your imagination reign supreme and come up with some crazy colour combos. Solid Colours serve to accentuate your party theme and are easy on your pocket as well. With solid colours you can never go wrong. Quantity Per Pack: - 16 Sunflower Yellow Paper Plates. Size: - 23cm Sunflower Yellow Paper Plates. Please Note: Solid Colour Shades May Vary. The Soild Colour Partyware is an exciting decorating option for any party, birthday or baby shower. Here at partyworld we carry a huge selection of Solid Colour tableware and partyware in all different colours of the rainbow. Let your imagination reign supreme and come up with some crazy colour combos. Solid Colours serve to accentuate your party theme and are easy on your pocket as well. With solid colours you can never go wrong. Quantity Per Pack: - 20 Sunflower Yellow Plaper Napkins. Size: - 33cm x 33cm Sunflower Yellow Paper Napkins. Please Note: Solid Colour Shades May Vary. Light up your party with our Sunflower Yellow Paper Lantern. Perfect for a variety of occasions our Paper Lanterns look beautiful indoors and outdoors. Our Paper Lantern comes in a pack of one and measures 10 inches in diameter. Please Note: These Lanterns are for decorative purposes only. Do not hang over light bulbs or near open flames. 10 inches in diameter. Every venue needs brightening up for a party and here at Partyworld.ie we have everything you need to transform your party venue. Choose form 100's of Party Supplies and Coloured Paper Lanterns for walls, ceilings and doorways. Enhance your party theme with stunning Scene Setters and Paper Lanterns. Turn your party from blah to wow with Chinese Lanterns from Partyworld.ie. From birthday parties to big events we have got you covered both online and in our Party Shop. 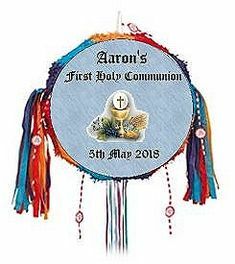 The Soild Colour Partyware is an exciting decorating option for any party, birthday or baby shower. Here at partyworld we carry a huge selection of Solid Colour tableware and partyware in all different colours of the rainbow. Let your imagination reign supreme and come up with some crazy colour combos. Solid Colours serve to accentuate your party theme and are easy on your pocket as well. With solid colours you can never go wrong. Quantity Per Pack: - 14 Sunflower Yellow Plaper Cups. Size: - 270ml Sunflower Yellow Paper Cups. Please Note: Solid Colour Shades May Vary. Add layers to your party with our Yellow Honeycomb Ball. The pack includes one honeycomb paper ball which measures 8 inches in diameter. The Paper Honeycomb Ball features a diamond cutout design and is perfect for hanging from ceilings or doorways to instantly bring fun to your party. Every venue needs brightening up for a party and here at Partyworld.ie we have everything you need to transform your party venue. Choose from 100's of Party Supplies and Paper Decorations for walls, ceilings and tables. Enhance your party theme with stunning Scene Setters, Paper Lanterns and Party Accessories. Turn your party from blah to wow with Birthday Party Supplies from Partyworld.ie. From birthday parties to big events we have got you covered. The Emoji Birthday Banner is made from cardstock material featuring our favourite emojis on a letter banner which reads Happy Birthday in blue lettering. The banner comes one in a pack and measures 6 foot long. Quantity Per Pack: - 1 Emoji Birthday Banner. Size: - 6 Foot Long. Bring smiles to your party table with our Emoji Tablecover. Featuring some of your favourite emojiicons. This plastic tablecover measures 54 inches by 84 inches and comes one in a pack. Quantity Per Pack: - 1 Emoji Tablecover. Size: - 54 inches by 84 inches. Serve up your party food with smiles with our Emoji Paper Plates which are decorated all over with Emoji icons. These paper plates come in a pack of 8 and measure 21.9cm in diameter. 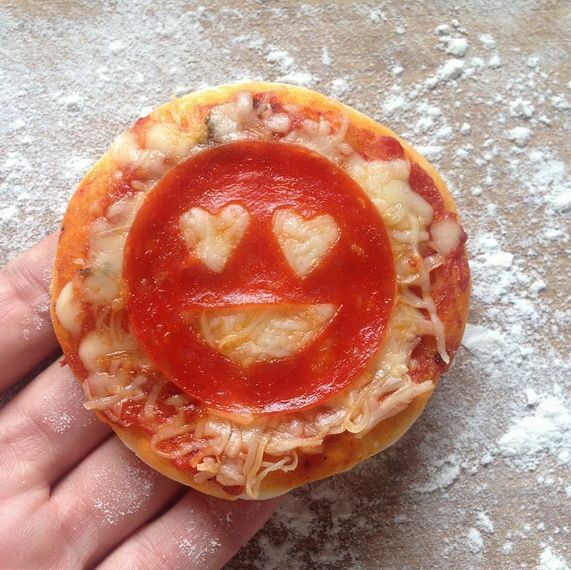 Quantity Per Pack: - 8 Emoji Paper Plates. Size: - 21.9cm in diameter. These Emoji Cups feature a wraparound print of your favorite emoji icons set against a blue background. The emoji cups come in a pack of 8 and are an 9 oz paper cup. Quantity Per Pack: - 8 Emoji Paper Cups. Size: - 270ml. Your young party guests will have no problem expressing their joy when they see this Emoji Plastic Cup on the refreshments table or in their favor bags.Surrounded with the most popular smiley face emoticons, this stadium cup will be an excel. Quantity Per Pack: - 1 Emoji Plastic Cup. Size: - 16 oz. What better way to finish off the party by sending your guests home with one of our Emoji Lootbags. These come in a pack of 8 and have cut out handles for easy carrying. Quantity Per Pack: - 8 Plastic Emoji Lootbags. Smiles all round when you use our Emoji Party Invitations to invite all your guests to your birthday party. Our invitations come in a pack of 8 and are accented with smileys from top to bottom and have the heading #Party at the top. Quantity Per Pack: - 8 Invitations. - 8 Envelopes. Create some hilarious photos with our Emoji Photo Booth Props. The photo props come in a pack of 8 and are attached to white plastic sticks. Quantity Per Pack: - 8 Emoji Photo Booth Props. Accent your ceilings and doors with our all new Emoji Swirl Decorations. These decorations feature a blue foil swirl which has an attached cardstock cutout of emoji . Quantity Per Pack: - 3 Emoji Swirl Decorations. This entry was posted on Friday, August 11th, 2017 at 12:55 pm	and is filed under Parties, Party Supplies, PartyWorld News. You can follow any responses to this entry through the RSS 2.0 feed. You can leave a response, or trackback from your own site.